Today is Independence Day in Vanuatu, officially the Republic of Vanuatu (Ripablik blong Vanuatu), an island nation located in the South Pacific Ocean. 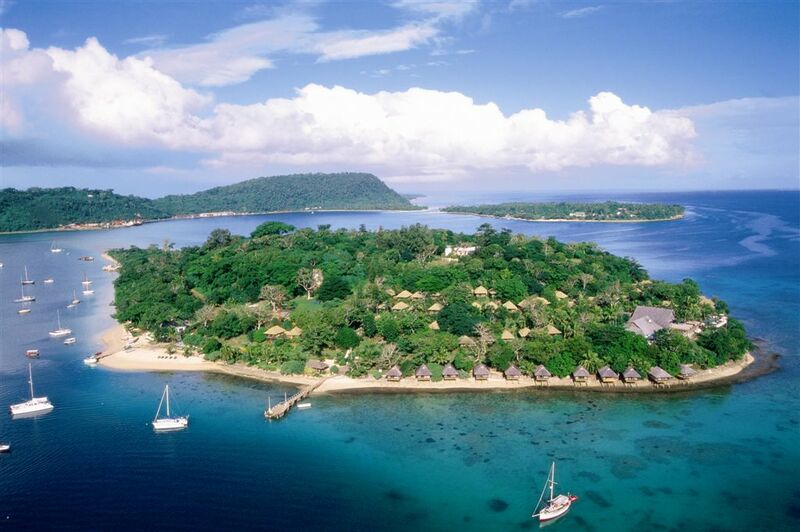 Vanuatu was first inhabited by Melanesian people. The first Europeans to visit the islands were the members of a Spanish expedition led by Portuguese navigator Fernandes de Queirós, who arrived in 1605. He claimed the archipelago for Spain and named it Espiritu Santo (Holy Spirit), which remained the name of the main island after the archipelago was renamed the New Hebrides. In the 1880’s France and the United Kingdom claimed parts of the country, and in 1906 they agreed on a framework for jointly managing the archipelago. An independence movement arose in the 1970s, and the Republic of Vanuatu was founded in 1980. 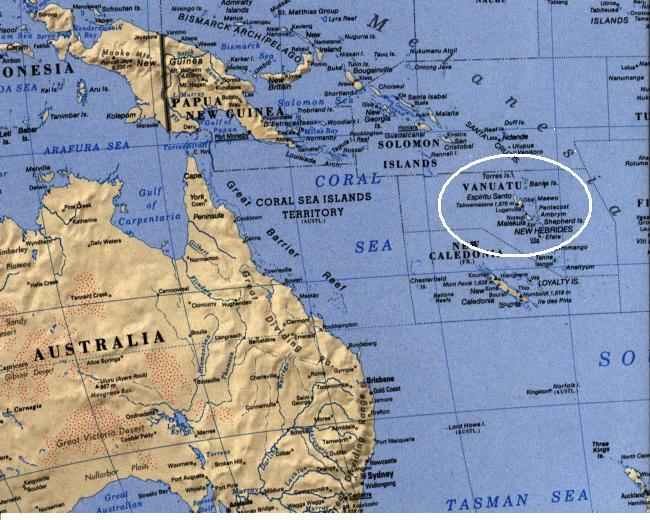 On independence the nation adopted the name Vanuatu, derived from the word vanua (“land” or “home”), which occurs in several Austronesian languages, and the word tu (“stand”). Together the two words indicated the independent status of the new nation. After the initial discovery in 1605, Europeans did not return until 1768, when Louis Antoine de Bougainville rediscovered the islands. In 1774, Captain Cook visited (naming them the New Hebrides), and in 1825, trader Peter Dillon’s discovery of sandalwood on the island of Erromango began a rush that ended in 1830 after a clash between immigrant Polynesian workers and indigenous Melanesians. During the 1860s, planters in Australia, Fiji, New Caledonia, and the Samoan Islands, in need of laborers, encouraged a long-term indentured labor trade called “blackbirding”. At the height of the blackbirding, more than one-half the adult male population of several of the Islands worked abroad. It was at this time that missionaries, both Roman Catholic and Protestant, arrived on the islands. Settlers also came, looking for land on which to establish cotton plantations. When international cotton prices collapsed, they switched to coffee, cocoa, bananas, and, most successfully, coconuts. Initially, British subjects from Australia made up the majority, but the establishment of the Caledonian Company of the New Hebrides in 1882 soon tipped the balance in favor of French subjects. By around the start of the 20th century, the French outnumbered the British two to one. Challenges to this form of government began in the early 1940s. The arrival of U.S. nationals (military and civilian) with their informal demeanor and relative wealth during World War II was instrumental in the rise of nationalism in the islands. The belief in a mythical messianic figure named John Frum was the basis for an indigenous cargo cult (a movement attempting to obtain industrial goods through magic), promising Melanesian deliverance from foreigners. 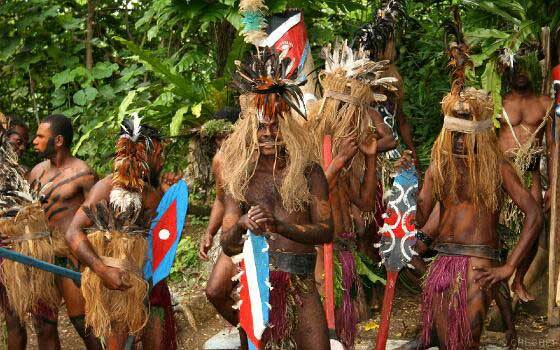 Today, John Frum is both a religion and a political party with two members in Parliament. Perhaps the final political impetus towards independence was the central issue of land ownership which arose during the 1960s. 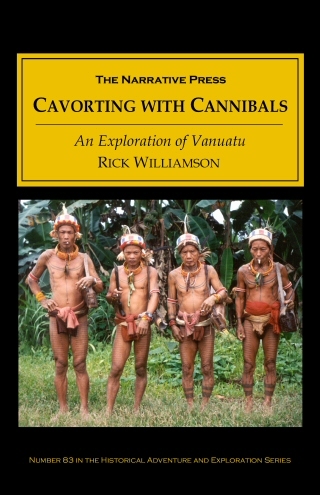 The ancient customs of the Ni-Vanuatu meant that land was held in trust for future generations by the current custodians. Europeans viewed land more as a commodity and owned about 30% of the land area. This European-held land had been mostly cleared for coconut production, but when they began clearing yet more land for coconut production, protests began in both Espiritu Santo and Malekula islands led by Jimmy Stevens and his kastom (indigenous heritage) movement called “Nagriamel”. In the 1960s France opposed Britain’s desire to de-colonize the New Hebrides, fearing that the independence sentiment would be contagious in their mineral-rich colonial possessions in French New Caledonia. The first political party was established in the early 1970s and originally was called the New Hebrides National Party. One of the founders was Walter Lini, an Anglican Priest, who later became Prime Minister. Renamed the Vanua’aku Party in 1974, the party pushed for independence. A Representative Assembly was created in 1975 but dissolved in 1977 after demands for the elimination of government-appointees and immediate independence. In 1979 foreign owners were dispossessed and received compensation from their own governments. On 30 July 1980 the fully independent Republic of Vanuatu was created. 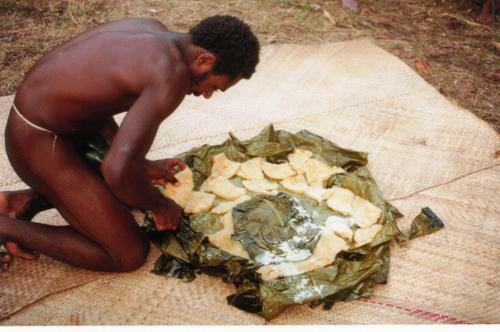 The cuisine of Vanuatu incorporates fish, root vegetables such as taro and yams, fruits, and vegetables. Most island families grow food in their gardens, and food shortages are rare. Papayas, pineapples, mangoes, plantains, and sweet potatoes are abundant through much of the year. Coconut milk and cream are used to flavor many dishes. Most food is cooked by boiling or steaming. Fried foods are not common. Festive dishes are cooked in a covered pit with hot stones and wood coals. 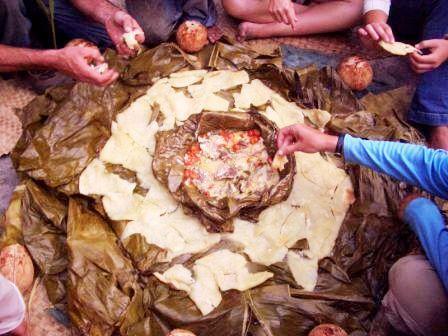 Lap Lap, the national dish, is cooked this way. Lap lap is easily made at home. 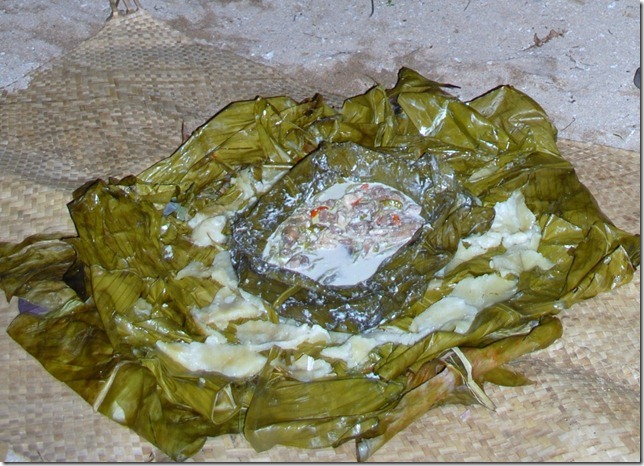 This recipe which I have adapted from Me’a Kai: Flavors of the Pacific, by Robert Oliver uses a grated taro base, topping it with spiced chicken, and smothering it in a gingery coconut gravy, wrapped in banana leaves. Oven baking the lap lap base means that it doesn’t get the same smoky flavor that an earth oven gives, but the banana leaves still do their job. You can add a teaspoon of liquid smoke to the coconut gravy if you like. Cook the lap lap in a casserole dish so that you can bring it to the table straight from the oven and eat it in island style straight from the cooking pot. Use pieces of thin flat bread to scoop out portions (right hand only). Make the coconut sauce by heating the oil in a heavy skillet on low heat and adding the spring onion, garlic, and ginger. Sweat gently for 2 -3 minutes. Do not let them take on any color. Add the flour and stir over low heat, for another 2-3 minute to make a roux. Pour in the coconut milk slowly, stirring constantly. Add the hot peppers, salt to taste, and a few grinds of black pepper (and liquid smoke if desired). Bring to a slow simmer and cook for 10 minutes. Set aside. Line a lidded casserole dish, or dutch oven, big enough to hold all the ingredients, with banana leaves, letting them lap over the edges. Combine all the ingredients for the base layer thoroughly in a bowl. Spread the base evenly over the bottom of the casserole. Heat the oil for the chicken layer over medium-high heat in a heavy skillet. Add the spices and stir for 2 minutes. Brown the chicken pieces a few at a time, placing them evenly on top of the base layer when they are done. Pour the coconut sauce evenly over the chicken. Wrap the banana leaves over the top sealing as tightly as possible. Put the lid on the casserole. Bake for 3 ½ hours. Remove the casserole lid, and pull out the package on to a large serving dish. Unfold the banana leaves using oven mits to protect from the steam. Bring to the table immediately and place the lap lap in the center. Break off pieces of flat bread and pinch out portions of lap lap.